The State of Telangana has been quite advanced when it comes to the use of technology. Can you dwell a little on that? After the formation of Telangana State, the government has given an excellent fillip, under the guidance of the Chief Minister, Chandrashekhar Rao. We have focused on implementation and use of technologies as a force multiplier. An Integrated Traffic Management Systems project is in the advanced stage of implementation. It will be Hyderabad City’s state-of-the-art project, just like what the developed nations have. We have also gone in for process implementation, technology improvements, people improvements, and the systems related implementations together to give the best facilities to the citizens, and best value for the money being invested. 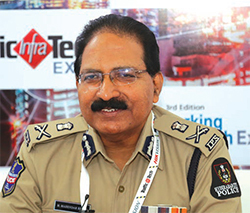 In addition to this, we also have a City-wide CCTV surveillance system, and use Big Data Analytics and several other technologies for cyber-crime investigation so that the government and the administration are in a position to give safe and secure environment for the citizens of Hyderabad and the State of Telangana. Technology has really helped us in implementing cop-less junctions. The people of Hyderabad know that they are under surveillance in terms of traffic violations. The penalties and the points system have been strictly implemented. As a result, we are very happy that even at 3 in the morning when no policeman is around, public at large follows the traffic norms, stops at red light and then proceeds further. It is a very heartening change in Hyderabad City and it is a great effort by the people of Hyderabad – they have fallen in line with the requirements of the road safety norms. 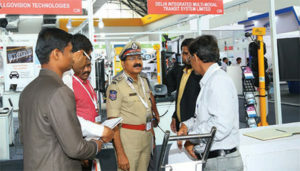 What is your impression of the TrafficInfraTech and ParkingInfraTech shows? We are very delighted to be associated with this exhibition. In fact, whatever the Telangana State government has been visualizing in terms of implementation of these technologies for parking management, traffic management systems, and public safety related technologies, we have been able to find each one of them exhibited here. It’s a great value addition for the city of Hyderabad and the state of Telangana.